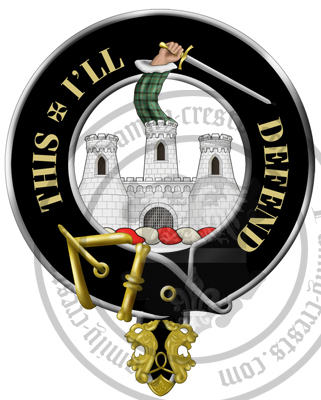 Clan Badge: A triple towered castle argent, masoned sable, and issuing from the centretower a dexter arm from the shoulder embowed, vested in the proper tartan of Kincaid and grasping a drawn sword all proper. The name Kincaid is believed to derive from a territorial origin. It may possably derive from the Gaelic words ceann cadh which means the steep place or pass but it could also be of the head of the rock. It could even mean the head of the battle. The family took their surname from the area which was about 30,000 acres. 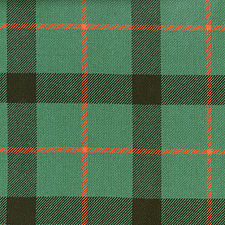 The Clan Kincaid supported King Robert the Bruce during the Wars of Scottish Independence. the clan fought against King Edward I of England and helped re-capture Edinburgh Castle in 1296. A Kincaid was made constable of the castle by Robert the Bruce and the castle was added to the Clan Kincaid arms and crest as recognition of their achievments. The family estates grew in the 16th century, through marraige the Kincaids gained the estate of Craiglockhart near Edinburgh, the estate of Bantaskin by Falkirk, Blackness Castle and the fields of Warriston which is now in Edinburgh. Chief Malcolm Kincaid led the clan in a battle against the Clan Stirling of Craigbarnet in 1563 where he lost his arm. However Malcolm continued to fight when he led the clan in another battle which took place between the Clan Kincaid and the Clan Lennox of Woodhead in 1570. Chief Malcolm was finally dispatched by a Stirling of Glovat when the Clan Kincaid and Clan Stirling fought another battle in 1581. In 1600 John Kincaid of Warriston was murdered. His wife and one of his own grooms were implicated and both were put to death for their crimes, the wife beheaded and the groom 'broken on the wheel' a particularly grizzly punishment. During the Civil War the Kincaids supported the Royalists and as a result suffered during the period prior to the restoration of the monarchy with many of the clan emigrating to America. The Kincaids spent much of the Civil War fighting battles in Ireland. During the Jacobite Uprisings the Clan Kincaid continued their support of the Jacobite House of Stuart. Many lives were lost in both the 1715 and 1745 to 1746 rebellion. Several Kincaids escaped to Virginia. Scottish: habitational name from a place near Lennoxtown, north of Glasgow, which is first recorded in 1238 as Kincaith and in 1250 as Kincathe. The former spelling suggests derivation from Gaelic ceann 'head', 'top' + caithe 'pass', whereas the latter would point to cadha ‘quagmire’ as the second element.